We are going full speed ahead with Saira's wedding planning. The date is pretty much set, which means time to plan the Save the Date cards! 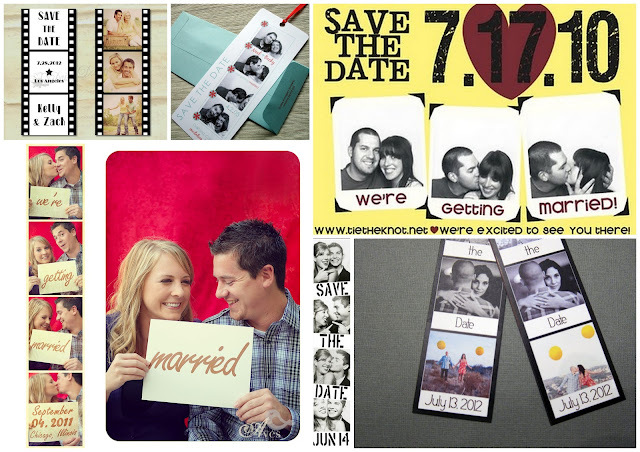 We've already posted on some fun and creative Save the Date ideas in the past, but today we want to focus on photo booth save the dates. Yes photo booths are a bit overdone on the wedding scene, but that doesn't mean they're still not fun! It's a relatively cost effective option where you can involve fun visuals and crafts. There are a number of ways to do it -- stick the photo on card stock for a basic Save the Date card, create a larger card using photo strip images, or convert the photo strip into a magnet or book mark. You don't need to get a professional photographer to help you out either. Let us know if any you are feeling any of these options, and we'd love some suggestions! Nice wedding planning ideas for this real weddings. Photo booth rentals are becoming a popular option for those who are looking for something interesting and unique for their event. And it is also good to help you create souvenirs.